Sketch Fridays #36 – Katana. Click image for a larger version. Though covered a bit previously, Josh Tobey and I created a superhero team together whose name bounced around but always included “Cyber” somewhere in it––”Cybers,” “Cybernet,” “CyberTech.” The team comprised four members: Backfire, Razorpoint, Katana, and Shockwave. With a nice even number like that, Josh and I split the designing duties evenly. I had Backfire and Razorpoint––both previously featured on Sketch Fridays––and Josh came up with the remainder. To that end, I must redesign all of them as a Sketch Friday. I must admit, however, that the previous Sketch Friday redesigns of my old high school characters really stirred a lot of thought in me so far, trying to find a modern resonance within the swaths of ’90s aesthetics and derivative design choices. With Katana, however, I decided to lean into the absurdity a bit more, perhaps because he isn’t “my” character. 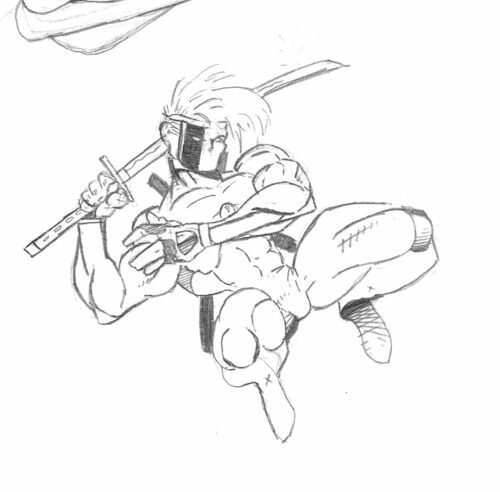 A drawing of Katana from 1994. Katana, if I’m not mistaken, was a character that existed before our superhero team; a power fantasy of Josh’s invention. If Venture was my version of Highlander, Katana was Josh’s version of The Terminator. While talking back and forth with Josh over the last week or so, trying to remember who exactly the character was, we learned that Katana’s origin became pretty difficult to nail down. Of all the characters featured in this retrospective, Katana is surely the oldest (in terms of creation), so his story was malleable to fit whatever nebulous story we were trying to fashion at the time. The basics are as follows: Katana was an android/cybernetic being/biomechanoid created by scientists in the far future (one of them, apparently, a descendant of Razorpoint). At the time of his creation, humanity was under extreme threat by an alien invasion in a war that had raged, off and on, for centuries but had picked up steam and humanity was losing against the surge. The plan was to send Katana back in time to eradicate the alien threat upon its initial arrival. However, they sent him back too far. At points, Katana went as far back as the Stone Age and slowly wended his way forward through time and consistently failed at his duty. The aliens arrived, but he didn’t stop them. So, he waits for them to show up again and give it another go. A Katana drawing from ’95 or ’96. Perhaps this is what causes him to join up with Backfire, Razorpoint, and Shockwave. Perhaps he created the team. Either way, he was the perpetual loner, wisecracker, and stoic that every teenage boy would create. As I was redesigning him, I honestly felt to make it meet the standards of my modern sensibilities would require too much revision so as to render him unrecognizable. So, instead, I focused on visuals and doubled down on the ’90s-ness of him. My later character, Venture, was basically a fantasy version of the sci-fi Katana––immortals moving forward through history in real time, permanently bonded face masks, big swords––and Josh and I worked hard to intertwine their stories as often as possible. So, to distinguish him from Venture––and to play with the sci-fi tropes a bit––my main focus was on his mask, and it gave me a lot of trouble. Eventually, I stuck with the permanently affixed mask but broke it up into pieces so he could still talk and emote if needed. My basic inspiration for that was a cross between (and I hate to say this first one) the designs from the Michael Bay Transformers movies and how they created emotive but mechanical faces and the faces of the Turian race of aliens from the Mass Effect video game series. 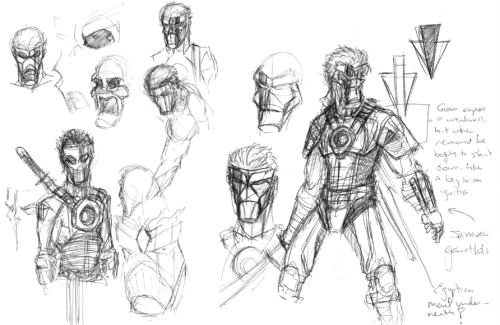 For both, instead of muscles under skin, the face is broken up in to hard plates that rest on top of a muscular (or whatever) structure and shifted and moved when they talked or emoted, and I thought that, while possibly more effective in an animated form, this could be a cool effect for Katana’s mask instead of just being hockey protective gear. The final design ended up a bit Iron Man, but it still works. Ironhide from Transformers (left) and a Turian from Mass Effect (right). As for the costume, I focused on creating a united aesthetic between the other members of the teams so far while incorporating aspects of the classic Katana design (shoulder pads, designs on the legs, eye stripe). 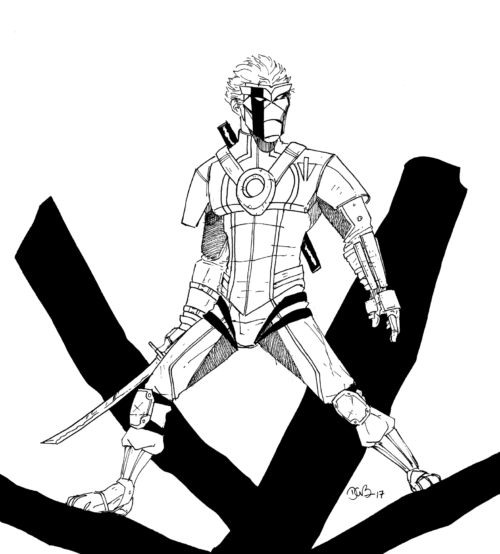 For his legs, I drew heavily on the design of the character Solid Snake from the first Metal Gear Solid game; since Katana has a pretty clear ninja heritage, too, I wanted to give him clothing that could move and be quiet while walking or running. Development sketches for the Katana redesign. Click to enlarge. One idea I didn’t incorporate more of was that he would be adorned with different pieces of armor/clothing from the ages and countries he visited throughout his millennia-long lifespan. The only real remnant of that is the gauntlets which are based on samurai armor. 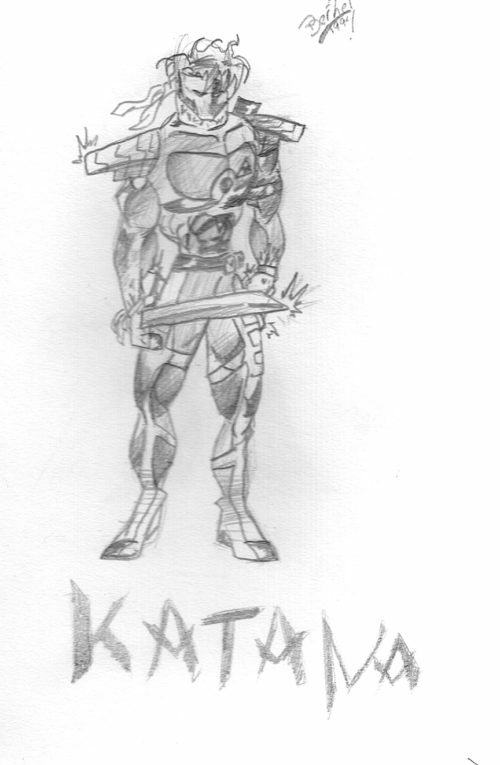 So, this was basically my effort to design a “Cyber-Group” version of Katana. However, I have it on good authority that, next week, we’ll have a redesign of the character in a more “solo series” mode by Katana’s creator himself. 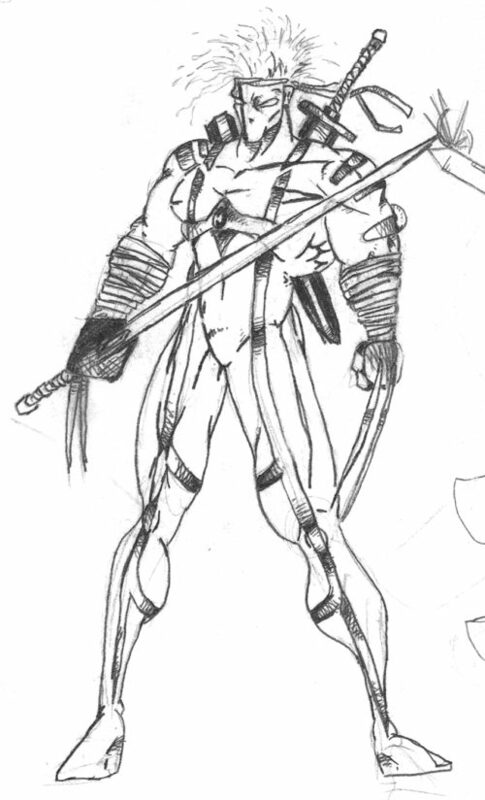 A drawing of Katana by Josh Tobey from 1994.